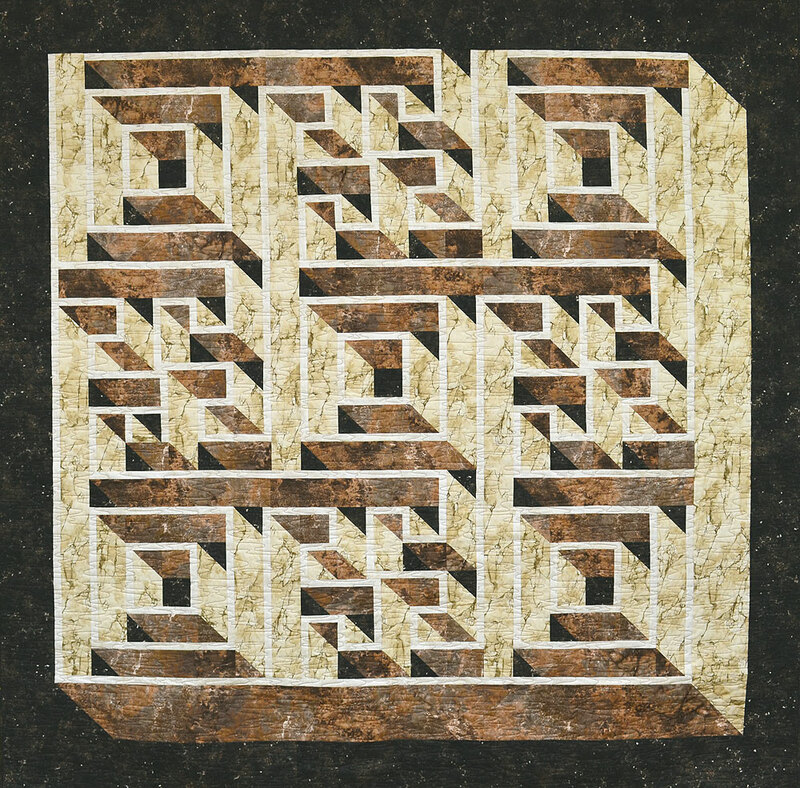 Need a break from quilting? Sometimes you just want a quick project, where you see results at the end of the day. The Fold ‘n Stitch wreath will give you a lovely 3-D project that can be used as a wreath for the door or wall, or as a table topper. You can make it in various fabrics for different seasons. And it would be a great Christmas gift. We have kitted this in two colourways. One that is in the traditional Christmas of red and green shown below. Each kit contains the pattern, pre-cut foam interfacing, fabric, and matching beads. Both kits are available for purchase on our secure on-line store. Click on the picture to view on our webstore. If you live nearby, Leslie is also holding a one-day class on making this wreath. There are two dates available – Tuesday, August 9 or Sunday, August 21 – both from 10 am to 4 pm. The price for the class is $35. Here’s your chance to get a head start on Christmas. In May our store put 247 bolts of batik on sale for $8.99 per meter. 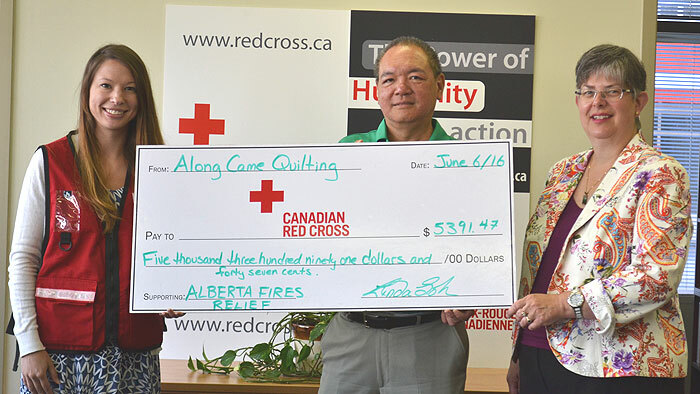 From every meter sold, $2 was for donation to the Canadian Red Cross Alberta Fires Appeal. I am so thrilled with the huge support for this fundraiser from our customers near and far. 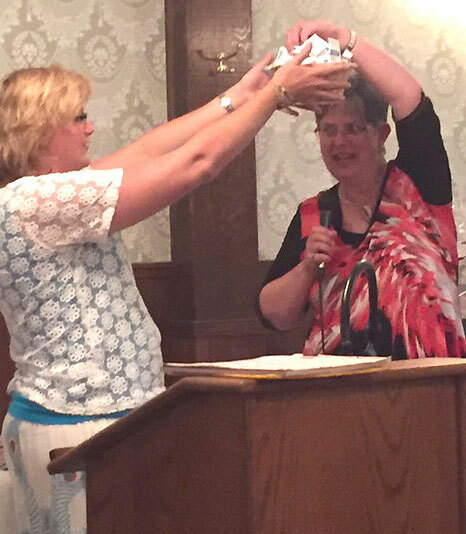 We sold 2695.735 meters of fabric, equating a donation made today in the amount of $5391.47. When Frank and I went down to the Canadian Red Cross offices, it was buzzing with evacuees and their families. 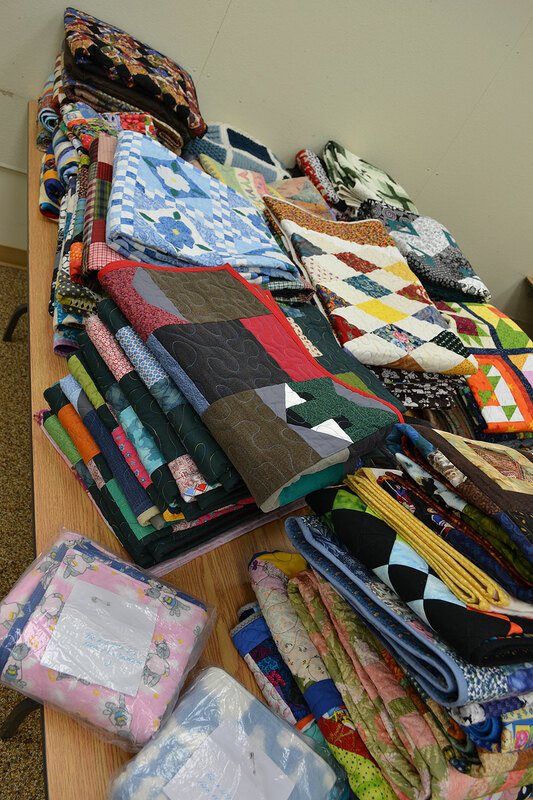 How wonderful for these people to receive help from the quilting community. Thank you so much for making this happen. Along Came Quilting is the sponsor for the entertainment at the Festival of Quilts dinner. Another fantastic 3-course meal with wine was served at the Wainwright Hotel. Braised beef short rib was the entree and it was very yummy. I really must remember to take pictures for everyone to drool. 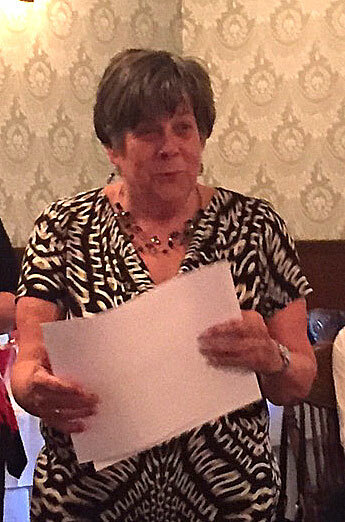 Following dinner, Catherine Redford provided us with a entertaining trunk show. She had lots of quilts to share and kept us all amused with her humour and eclectic variety. The store once again donated two door prizes at the end of the evening. Kelly Smit of Heritage Park held them high! The first one drawn was for a $100 shopping spree. Linda D. was the happy recipient. 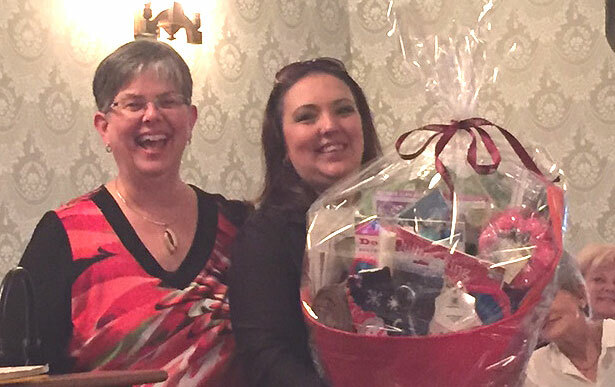 The second door prize was the tub of fun with a wide range of quilting and sewing products valued over $500. 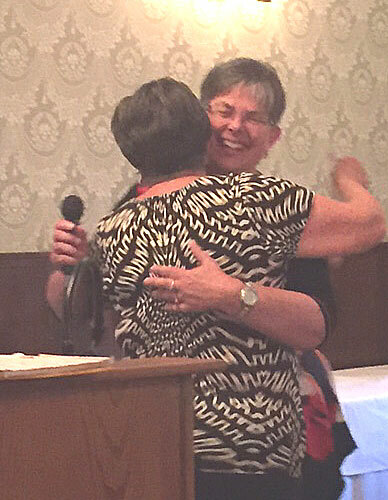 A new quilter, Vicki D. won. At the end of the evening, Kim M. and I admired Jacque H’s outfit. 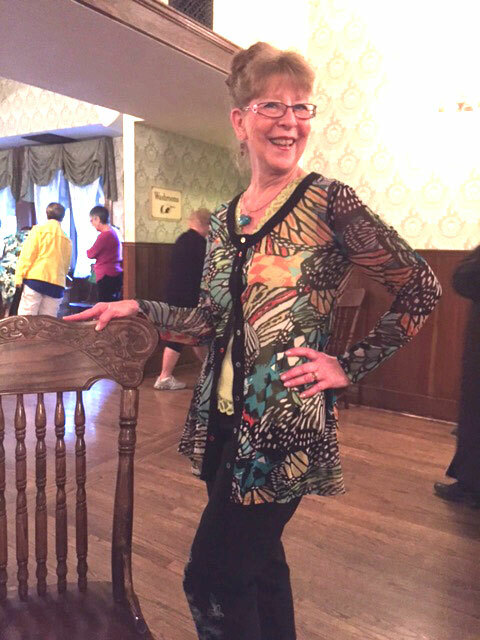 What a fabulous design her top would be in quilting cotton! 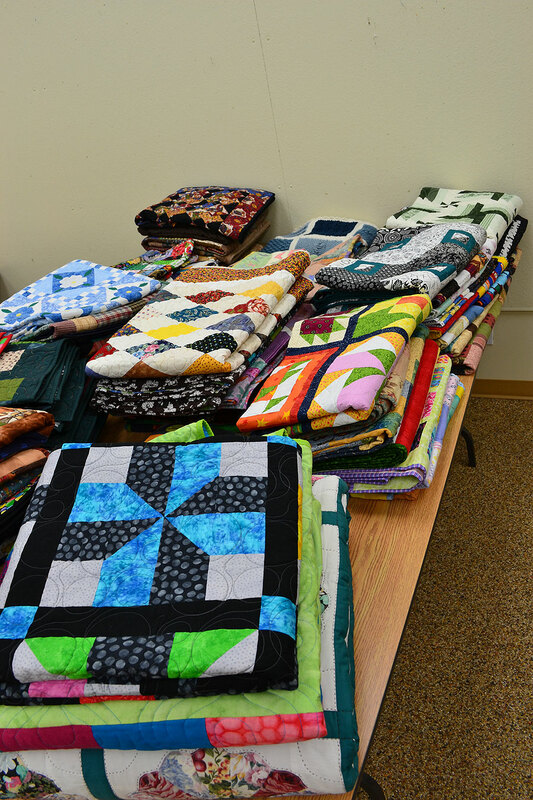 Thank you to everyone who has brought in quilts and crocheted blankets for donation to Fort McMurray. We are passing the 68 we have received (locally and from BC), shown below, to Erie Quilt Art Distributors who are providing storage for these. 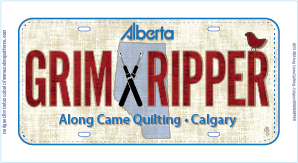 They are working in conjunction with the coordinator of the Facebook page, Quilts for Fort McMurray.